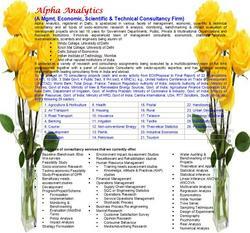 Scientific & Technical Consultancy Services"
Established “Scientific & Technical Consultancy Services"
With Laboratory facility at Bhavnagar - India. Chromatin immunoprecipitation (ChIP) followed by sequencing is a powerful method to determine the locations of DNA binding sites for a protein (transcription factor) of interest. Determining protein-DNA interactions involved in gene regulation is essential to fully understand biological processes and diseases. Advisory and consultancy services to clients (individual/industrial/institutional/public-sector) for concept validation through laboratory and field analytical support covering establishment to testing of quality standards in natural products, botanicals, herbals or alternate medicine system, agro products, nutraceuticals and functional foods.